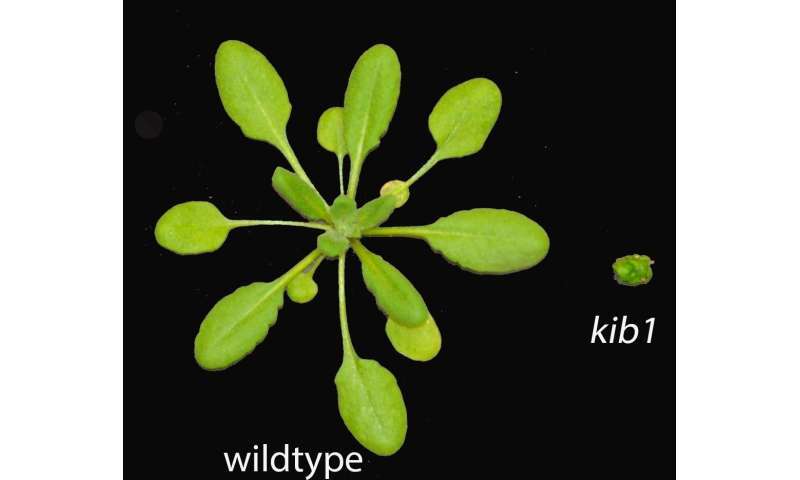 A comparison of a normal plant and KIB1-lacking mutant plant. Credit: Jiaying Zhu. Plants are stationary. This means that the way they grow must be highly internally regulated to use the surrounding resources in the most-advantageous way possible. Just imagine if you were stuck in one spot and had to strategize to keep getting water and nutrients from the ground beneath your feet and sunlight on your skin. That's how plants live! It can turn on or off more than 2,000 plant genes, and is crucial to normal plant growth—including stem architecture, flowering, and the development of pores called stomata through which plants "breathe"—as well as to a plant's environmental stress responses. Mutant plants that lack the ability to make brassinosteroid have defects throughout their lifecycle, including dwarfism, late flowering, and sterility. Like all hormones, brassinosteroid controls a chain of cellular proteins, each acting on the next to either activate or inhibit its activity in the interest of maximizing the plant's growth and survival. New research from Carnegie's Jia-Ying Zhu and Zhi-Yong Wang identified one missing link in the brassinosteroid signaling chain, which is called KIB1. They found that K1B1 is an essential part of brassinosteroid's effectiveness as a master-regulator. "Elucidating hormone signaling pathways is like putting together a puzzle," Zhu said. "We uncover one piece at a time, working toward a full picture." Wang's lab has spent years homing in on the chemical cascade by which brassinosteroid activates and deactivates different proteins in a plant cell. Gaining a complete understanding of how such a master hormone works could help scientists find targets for engineering high-yield crops and fighting world hunger.